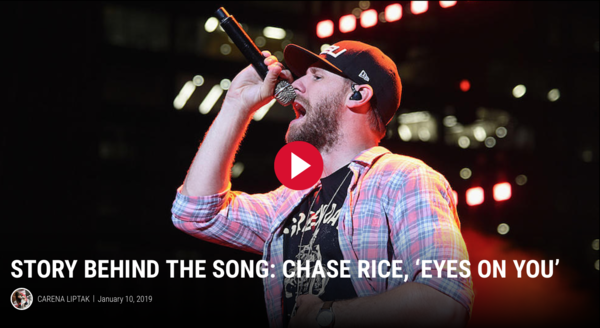 The day Chase Rice wrote "Eyes on You," the country singer knew he had something special on his hands. The single has gone on to become, according to Rice, his "biggest song as an artist to date," inspiring the name of his 2018 Eyes on You Tour and captivating a whole new fanbase with its upbeat, romantic storyline and universal message. Read on to learn all about the day that Rice wrote the song, as well as his thoughts on why "Eyes on You" connects with so many fans and invites listeners to make the track their own. The day we wrote it -- I mean, some days are more special than others. We knew it was gonna be a big song, and we knew it was gonna be a single. It's just the idea that you travel the world with a girl that you love and you kind of miss it, because your eyes are on her. It's just got so much melody. It's got such a great piano part right there at the beginning that everything kinda fell together that day. It's got an unbelievable melody to it, and then the storyline -- everyday wants that. Every guy wants to look at a girl like that. Every girl wants her guy looking at her like that. So I think it just connects to people in terms of what they want in life. It's probably my biggest song as an artist to date. I LOVE All Eyes On YOU, I definitely heard it before it was released to radio, of course for me, it’s me signing it, and feeling the focus should be All Eyes On YOU, or him...I willed it in Vegas. Three Cords and The Truth hits home, Springs from a Real life moment for me, a real life decision, that is now spread into the heart and soul of so many songs it’s hard not to just get carried away...Traveled to OHIO, dreadful, lol ????4???????????????????????????????????????????????????????????????????????? © 2019 Chase Rice. All rights reserved.